With frigid Northern Plains winters, among the most-needed items for Elders are socks, underclothes, and blankets. Old age and impoverishment often make a spirit-crushing combination. Add to that the harsh climate and isolation of reservations in the Northern Plains and what you have is anxious need among vulnerable Elders. 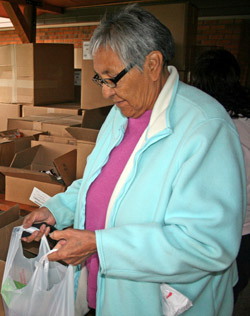 With the traditional generosity of Native American communities, families and friends do all they can to help, but resources across the reservation can be stretched perilously thin. The nearest towns may be several hours away over rough roads. Reliable transportation is sometimes scarce and money for gas and purchases even more so. NPRA helps ease these hardships and meets immediate needs through a unique partnership with Native American volunteers on each reservation. These volunteers — whom we call our Program Partners — identify the needs of their communities, ensuring that seniors remain a priority. Other community members give of their time to unload, sort, and distribute goods to those in need. With frigid Northern Plains winters, among the most-needed items for Elders are socks, gloves, hats, blankets, nonperishable food, batteries and flashlights and other winter emergency supplies. PWNA helps meet these needs by distributing winter emergency boxes to Elder Nutrition Centers serving hot lunches for Elders; the boxes are distributed (or home-delivered) to the Elders as part of our winter warmth effort.